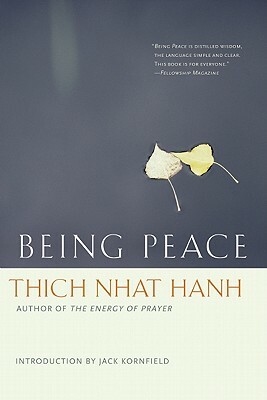 A bestseller with over 250,000 copies sold, Being Peace is the seminal founding work by Zen Master and Nobel Peace Prize nominee Thich Nhat Hanh. With a new introduction by Jack Kornfield and the first update since its release over fifteen years ago, this eloquent meditation on "being peace in order to make peace" is more relevant than ever. A book for everyone concerned about the state of the world and the quality of our lives, it has lost none of its timeliness since it was first published in 1987. It is filled with practical suggestions how to create a more peaceful world "right in the moment we are alive." Contains Thich Nhat Hanh's key practices, including a guide to the practice of reconciliation which has become a peacemaking tool in many other religious traditions. This beautiful, newly revised edition is the perfect starting point for those who are getting their first introduction to Buddhism as well as a must-have for those already engaged in the tradition. With illustrations by Mayumi Oda. Thich Nhat Hanh is one of the most revered Zen teachers in the world today. His best-selling books include Happiness and Peace Is Every Step. He lives in Plum Village in southwest France, where he teaches the art of mindful living. Jack Kornfield was trained as a Buddhist monk in Thailand, Burma, and India and has taught around the world since 1974. He also holds a Ph.D. in clinical psychology. He is a co-founder of the Insight Meditation Society and of the Spirit Rock Center and has written several books. Mayumi Oda (Illustrator) was born in Tokyo, Japan, in 1941. Her paintings are exhibited internationally, and her recent work as an activist includes coordination of the World Court Project, an effort to make nuclear weapons illegal, and helping to establish a women s refuge center in Phnom Penh, Cambodia. Mayumi currently lives, farms, and swims in Kealakekua, Hawaii. Arnold Kotler (Editor of First Edition) was an ordained student at the San Francisco and Tassajara Zen Centers from 1969 to 1984. He was the founding editor of Parallax Press and now resides in Hawaii.